Edifices for Worship of Fortress Type in Belarus, Poland and Lithuania is part of the Tentative list of Belarus in order to qualify for inclusion in the World Heritage List. I was a bit baffeled by this project : it sounds like a trans-national nomination, but is only mentionned on the Belarus TL, with only three compnonents. I visited two on them on my 5-day visa-free visit to Belarus. It was close to my itinerary in and out of Hrodna. I had a rental car, which made it easy to reach. There are no signposts, but I had printed out google maps. The church-fortress in Muravanka, is few km south of the main Minsk-Hrdona M6 highway in the middle of the village of the same name. It was constructed between 1516 and 1542. It is an orthodox church with Gothic and Romanesque architecture style. Since 1990, the Church is again an active place of worship. It was closed the day I visited, but could get a good view of its impressives exterior walls and towers. The second church is the Synkavichy Church. 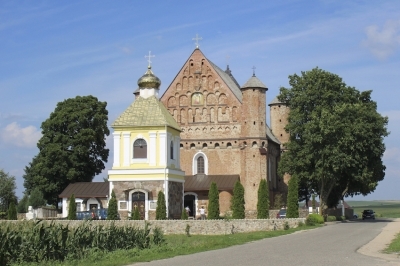 It is situated a few km west of the town of Slonim. The church was made of brick in the middle of the 16th century with Gothic-style features. The church was probably constructed by local workmen who used simple, not very precise sizing tools for the lay-out. It switched several times between Catholic and Orthodox church. Today the church is an active orthodox place of worship. The defensive nature of both churches is visible from far, with their four towers on each corners, arrowslits and murder-holes. They are impressive and massive, especially Synkavichy as it lies in the middle of corn fields. I missed the third church on the list : the Catholic Church of St. John the Baptist in the village of Kamai was constructed of brick in 1603-1606. It is situated in the north of Minsk, near the Lithuanian border.